This article is about the American songwriter. For the Canadian author, see Dianne Warren. Diane Eve Warren (born September 7, 1956) is an American songwriter. She rose to prominence in 1983, and has since written songs for and co-written songs with multiple singers, as well as for several films. Warren has had nine number-one songs and 32 top 10 songs on the Billboard Hot 100 chart. Additionally, two of the top 13 hits in the Hot 100's 57-year history were written by her. Warren's career catapulted in the late 1980s shortly after joining forces with the UK music company EMI when Warren became the first songwriter in the history of Billboard magazine to have seven hits, all by different artists, on the singles chart at the same time prompting the UK's former Chairman of EMI Music Publishing Peter Reichardt to credit her as "the most important songwriter in the world". She has been rated the third most successful female artist in the UK. Warren has won a Grammy Award, an Emmy Award, a Golden Globe Award, three consecutive Billboard Music Awards for Songwriter of the Year, and has been nominated for ten Academy Awards. She has been inducted into the Songwriters Hall of Fame and received a star on the Hollywood Walk of Fame. Her UK success saw her win an Ivor Novello Award from the British Academy of Songwriters, Composers and Authors when she received the Special International Award in 2008. Warren owns a publishing company, Realsongs, which gives her control over her compositions. Warren, the youngest of three daughters, was born to David, an insurance salesman, and Flora Warren, in the Los Angeles community of Van Nuys, where she said she felt misunderstood and "alienated" as a Jewish child growing up. Her family's surname "Warren" was originally "Wolfberg", but her father changed the name because it sounded too Jewish. Warren says she was rebellious as a child and told NPR's Scott Simon that she got into trouble and ran away as a teen but returned because she missed her cat. As a child, Warren loved listening to the radio and dreamed of performing on the radio herself. She was also influenced by music through her parents and her sisters who would play music. She began writing music when she was 11 but took a more serious approach at 14, commenting "music saved me." Warren has said that her mother asked her to give up her dream of a songwriting career and take a secretarial job. However, her father continued to believe in her and encouraged her. In addition, he bought her a 12-string guitar and a metal shed for her to practice and took her to music auditions. She wrote Celine Dion's 1996 song "Because You Loved Me" as a tribute to her father for his encouragement. She briefly attended college at Los Angeles Pierce College and California State University, Northridge but considered it a waste and spent more of her time writing songs while attending. On the February 12, 2016 edition of All Things Considered, Warren said that she had been molested at age 12, and had later experienced sexual harassment and assault by a sound engineer during her working career. Warren's first hit was "Solitaire", which Laura Branigan took to No. 7 in the U.S. pop charts in 1983. She's actually more like the Emily Dickinson of Pop. As in the case of the great nineteenth-century reclusive New England poet known for her simple yet eloquent verses, Warren leads a life focused almost entirely on her art. The original name for her publishing company, Realsongs, was "Warren Piece" because "War and Peace" was already taken. In 1998, Realsongs and its international partner, EMI Music Publishing, distributed A Passion For Music, a six-CD box set that showcased her music. EMI Music's London office assisted in distributing 1,200 copies of the box set primarily to the film and television industry for consideration in soundtracks and other commercial endeavors. It was not marketed to consumers. As of 2011[update], Warren's music has appeared in the soundtracks of over sixty films. She was awarded a star in the Hollywood Walk of Fame in 2001. The Diane Warren Foundation, in conjunction with the ASCAP Foundation and the VH1 Save the Music Foundation created a joint initiative, beginning in 2000, called Music in the Schools. The initiative provides sheet music, band arrangements, folios, and method books to each of the schools that are already recipients of musical instruments from the VH1 Save the Music Foundation. In 2004, Warren released a compilation album of love songs, titled Diane Warren Presents Love Songs, which includes several of her award-winning hits. Warren continues to write hit songs for and with artists of all mainstream genres, including Whitney Houston, Belinda Carlisle, Britney Spears, Marcia Hines, Christina Aguilera, Beyoncé, TLC, Aaliyah, Elton John, Cher, Tina Turner, Bryan Adams, Selena, Jessica Simpson, Air Supply, Olivia Newton-John, Barbra Streisand, Aretha Franklin, Roberta Flack, Roy Orbison, Trisha Yearwood, Patti LaBelle, Michael Bolton, NSYNC, Gloria Estefan, Reba McEntire, Enrique Iglesias, Paloma Faith, Russell Watson, Rod Stewart, RBD, Aerosmith, The Cult, Kiss, Ricky Martin, Faith Hill, Meat Loaf, Celine Dion, Mariah Carey, Toni Braxton, Exposé, Leigh Nash of Sixpence None the Richer, LeAnn Rimes, Kierra Sheard, Lady Gaga, Claire Richards, Westlife and so on, producing some of the songs as well. Her songs have been covered by artists including Joe Cocker, Weezer, Edwin McCain, Milli Vanilli, Mark Chesnutt, and so on. Warren wrote three songs for Carrie Underwood's debut album, Some Hearts (2005) that were "Lessons Learned", "Whenever You Remember" and the title track. In 2009, Warren co-wrote the United Kingdom's entry in the Eurovision Song Contest with Andrew Lloyd Webber the song "It's My Time". It was sung by Jade Ewen and achieved 5th place, the best for the U.K. since 2002. In 2010, Warren partnered with Avon Products as a celebrity judge for Avon Voices, Avon's first ever global online singing talent search for women and songwriting competition for men and women. For the competition, Warren wrote a special anthem which was recorded by the finalists and produced by Humberto Gatica. Warren has been recognized six times ASCAP Songwriter of the Year and four times Billboard's Songwriter of the Year. In 2012, Warren wrote the song "Counterfeit" for Tulisa's debut solo album The Female Boss. Warren wrote Paloma Faith's 2014 song "Only Love Can Hurt Like This". Warren's success in the U.S. has been paralleled in the U.K., where she has been rated the third most successful female artist. Peter Reichardt, former Chairman of EMI Music Publishing UK, credited her as "the most important songwriter in the world." Warren is the first songwriter in the history of Billboard magazine to have seven hits, all by different artists, on the singles chart at the same time. Warren has had nine of her compositions hit #1 in the US Billboard Hot 100, all by different artists, and overall more than 30 of her songs have hit the U.S. top ten. Additionally, two of the top 13 hits in the Hot 100's 57-year history were written by her - "How Do I Live" (number four) and "Un-Break My Heart" (number 13). She has had an even bigger success on the U.S. Adult Contemporary charts, where sixteen of her songs have gone to #1, and overall more than 40 songs have hit the top ten on that chart. In the U.K., Warren has had three #1 hits, and more than 20 top ten hits. She has been inducted into the Songwriters Hall of Fame and received a star on the Hollywood Walk of Fame. Warren has never married, and does not think of herself as a person of commitment. In interviews, she has stated a belief that her lack of a romantic life makes her more peculiar as a songwriter. She had a relationship with producer/songwriter Guy Roche which ended in 1992 and claims she has not had another relationship since, commenting "I've never been in love like in my songs. I'm not like normal people. I'm no good at relationships. I draw drama to me — it's the Jew in me". Although she considers herself to be cynical regarding romance, Warren does not let this affect her songwriting and prefers to write alone, commenting "When I write with other people the experience is different. You have to compromise, which I have problems with. I'd rather listen to my own mind". In a 2000 interview, Warren explained that she never let go of music despite experiencing rejections, depression and poverty. In 1994, Warren's house was damaged by the 1994 Northridge earthquake causing her to be miserable and homeless, drifting from hotels to rental houses. She has stated that therapy helped her with songwriting. She has also revealed that she works 12–16 hours a day, always takes her keyboard whenever she travels and is self-proclaimed and more active than when she was twenty years old. Warren does not usually allow anyone into her Hollywood Hills office which she describes as a "cluttered, airless room … nothing has been moved or cleaned for 17 years because she is superstitious" and prefers to think of that room as her "secret world". In that room, Warren records melodies with a tape recorder on which she plays them again and chooses the songs she likes the most. But in an interview with CBS News Sunday Morning correspondent, Ben Tracy, she allowed part of the interview to be taped in the office. ^ a b c "Diane Warren Bio". Mtv.com. Retrieved January 5, 2012. ^ a b "Diane Warren - Biography". AllMusic. Retrieved July 15, 2014. ^ a b c d "The Songwriter With a Golden Touch". Abcnews.go.com. Retrieved January 5, 2012. ^ a b c d e f g h i j Porter, Susanna (July 28, 2000). "RECORD WOMAN". Daily Record (Scotland). Retrieved January 5, 2013. ^ "Diane Warren Interview: I have not yet written my greatest song". Kingsorar.com. Retrieved January 7, 2013. ^ Laskow, Michael. "Diane Warren - Interviewed by Michael Laskow". Bmusic.com. Archived from the original on August 28, 2006. ^ Newman, Melinda (February 9, 2008). "Q&A: Songwriter Warren taps into '70s soul for 'Gangster'". Reuters.com. Retrieved January 5, 2013. ^ a b Hunt, Dennis (November 26, 1994). "The Ballad of Diane Warren, Songwriter". Latimes.com. Retrieved January 4, 2013. ^ Ulaby, Neda (February 12, 2016). "Diane Warren On 'Til It Happens To You,' A Modern Anthem For A Hard Truth". NPR. Retrieved April 6, 2018. ^ a b Atkinson, Brian T. (January 1, 2007). "DIANE WARREN: Real Songs for Real People". Americansongwriter.com. Retrieved January 5, 2013. ^ "Diane Warren". Latimes.com. Retrieved January 7, 2013. ^ "Diane Warren Teams up With Universal Music Group for International Publishing Deal". Billboard.biz. June 28, 2011. Retrieved January 7, 2013. ^ Sanderson, Elizabeth (January 24, 2009). "We wrote the Eurovision song in two hours, says Lloyd Webber". Daily Mail. Retrieved January 24, 2009. ^ Klier, Marcus (January 25, 2009). "United Kingdom: Song title announced". ESCToday. Retrieved January 25, 2009. ^ "Norway voted Eurovision winners". BBC News. Retrieved May 17, 2009. ^ "Avon Launches Avon Voices". Avoncompany.com. December 1, 2010. Retrieved January 7, 2013. ^ "Avon Honors Global Champions in the Fight Against Breast Cancer and Domestic Violence at the Avon Foundation Global Voices for Change Gala". Avoncompany.com. November 3, 2011. Retrieved January 7, 2013. ^ "Diane Warren Biography". Songwriters Hall of Fame. Archived from the original on September 10, 2012. Retrieved April 16, 2012. ^ "Digital Spy UK: Paloma Faith Releases New Single". Digitalspy.co.uk. Retrieved March 14, 2015. ^ "Radio 2 - The Diane Warren Story". BBC.co.uk. Retrieved March 14, 2015. ^ Gary Trust (January 26, 2016). "Ask Billboard: Diane Warren's Biggest Hot 100 Hits". Billboard. ^ "Diane Warren Exhibit Home". Songwritershalloffame.org. Archived from the original on January 4, 2017. Retrieved March 14, 2015. ^ Arianne Cohen (October 9, 2006). "I Belong to Me". Nerve.com. Retrieved March 14, 2015. ^ Sullivan, Caroline (May 13, 2009). "Diane Warren: 'I've never been in love'". Guardian.co.uk. Retrieved January 7, 2013. ^ Tracy, Brian (February 14, 2016). "The Tenacious Diane Warren and Lady Gaga". CBSnews.com. Retrieved February 26, 2016. ^ "Diane Warren Top ASCAP Songwriter". Tracy Chapman News at Yahoo! Music. Yahoo! Inc. May 20, 1998. Retrieved October 25, 2009. ^ "Repeat The Chorus: Warren Ascap's Songwriter Of Year". The Hollywood Reporter, archived at AllBusiness.com. May 18, 1999. Retrieved October 25, 2009. ^ Orr, Jay; Turneblah r, Shannon Wayne (October 3, 2000). "Los Angeles Comes to Nashville Pop Songwriter Diane Warren Named ASCAP's Country Songwriter of the Year". CMT News. MTV Networks. Retrieved October 25, 2009. ^ a b "Diane Warren - Awards". IMDb. Retrieved March 4, 2017. ^ "Past Winners Search: Diane Warren". Grammy.com. Retrieved March 4, 2017. ^ "WOMEN IN FILM, LOS ANGELES ANNOUNCES THE 2010 CRYSTAL + LUCY AWARDS® HONOREES". Wif.org. April 5, 2010. Archived from the original on March 9, 2012. Retrieved April 16, 2012. 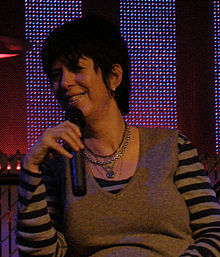 Wikimedia Commons has media related to Diane Warren.